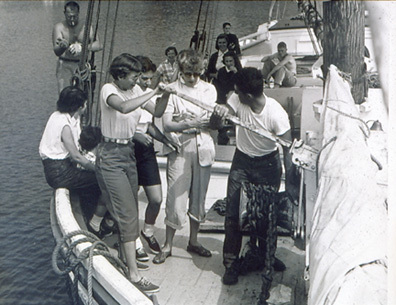 Tourists aboard the passenger schooner Mercantile assist in raising the anchor by working the windlass. Passenger labor is always welcome in working the windjammer schooners. Mercantile was launched as a small coasting schooner in 1916 by the Billings family on Deer Isle. After she fished for mackerel for a few years in the 1940s, she was bought by Captain Frank Swift who had started the passenger schooner business in Maine in 1936, sailing out of Camden.